•Dash & Windshield Wireless Charging Car Mount. •For use with QI compatible devices •Fast Charge •Micro USB input •Current and temperature protection •Transmission distance 8 mm •Rubber grip securely holds your smart phone •Quick lock and release installation lever •360 degree rotation for best viewing angle •Telescopic 【2-IN-1 DESIGN】This wireless charger combines charger and phone holder in one unit.You can put your phone on the holder and wireless charging your phone at the same time when you are driving.You can adjust the length of the holder to fit your phone to the best charge position. 【ONE HAND OPERATION】Using mobile phone gravity and linkage of the holder,it doesn't need complex operation to charge the phone.When the phone is put up,the left and right sides will grip the phone automatically.One hand operation,simple and convenient. 【TWO INSTALLATION WAYS】Come with an air vent mount and a suction mount for two different installation options.Provide flexible viewing angles with the 360°rotating ball joint on both mounts.The sucker can be repeated paste,to keep the holder tight enough,please fasten the locking buckle,the suction mount is not only used in your car, but also can be used in your office or your room. 【2-IN-1 DESIGN】This wireless charger combines charger and phone holder in one unit.You can put your phone on the holder and wireless charging your phone at the same time when you are driving.You can adjust the length of the holder to fit your phone to the best charge position. 【ONE HAND OPERATION】Using mobile phone gravity and linkage of the holder,it doesn't need complex operation to charge the phone.When the phone is put up,the left and right sides will grip the phone automatically.One hand operation,simple and convenient. 【TWO INSTALLATION WAYS】Come with an air vent mount and a suction mount for two different installation options.Provide flexible viewing angles with the 360°rotating ball joint on both mounts.The sucker can be repeated paste,to keep the holder tight enough,please fasten the locking buckle,the suction mount is not only used in your car, but also can be used in your office or your room. 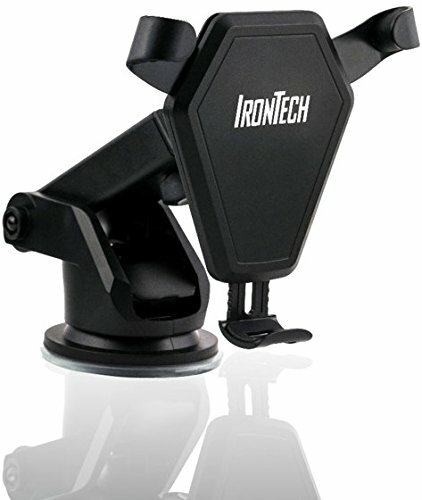 If you have any questions about this product by IronTech, contact us by completing and submitting the form below. If you are looking for a specif part number, please include it with your message.